WERS did it again. The other morning, I was sitting at my desk when a vaguely familiar tune began playing. It was crisp, delicious power pop, with an early ’80s sound. I quickly went to WERS.org and saw that the song was “Whenever You’re on my Mind” by Marshall Crenshaw. Before I left for work, I had ordered a two-disc, 30-song collection of his work from eBay.It never ceases to amaze me. Certain songs, even if you’ve only heard them once before, can leave such a profound influence that, even upon hearing them years later, they are raised to the surface and freshly recalled as if the album has been in heavy rotation for years. Or maybe those songs simply contain elements so universal and essential that they sound familiar, like a root language. Either way, when I make those discoveries (or rediscoveries), it’s always a treat. I couldn’t muster love for the Bird and the Bee‘s Hall & Oates tribute album, and I didn’t know why. It just sounded same-y and uninspired. All of Hall & Oates kitschy, quirky glory had been whitewashed with a muted, hipsterrific veneer. Then, Matt Dyson (@dirkler on Twitter) made me realize why I felt that way. Because it’s true! When you have The Bird and The Bee take Hall & Oates and treat them as elder statesmen for a tongue-in-cheek society that wants to be taken seriously, what ends up happening is similar to when you watch a bad movie that is in fact much too bad: you watch and giggle for about a half hour, then suddenly get bored with being ironic about it and just want to be entertained. The other evening, I was walking home from work when Roxy Music‘s “More Than This” came on my iPod. I was nearly stopped in my tracks by the all-consuming need to, at that moment, watch the movie “Lost in Translation.” So what did I do? Shortly after I got home, I popped it in, of course. What choice did I have? I’ve always been a huge fan of that movie — it’s probably in my top 10 of all time. Not just any movie can hold me emotionally rapt even when the viewings have likely entered the double-digits. One of the most compelling things about “Lost in Translation” is the music. Each song so profoundly aligns with the emotion of the scene which it accompanies. The scene featuring “More Than This” — when Bill Murray’s Bob Harris sings it in the karaoke lounge, obviously directing it toward Scarlett Johansson’s Charlotte — is taut with longing, and that song represents exactly what both of them are feeling at that moment. No wonder simply hearing that song on my iPod instantly connected me to the movie and tapped my affection for it. Music has always been an emotional interest for me. I invest a lot in a song — maybe too much — but songs help me understand the world and my own weird life. That said, when I make a mix CD for somebody, it’s rarely just a random collection of recent songs, or genre songs. It’s an emotional journey across the entire arc of a series of events or feelings, whether it’s graduation or moving or finding true love or losing true love. 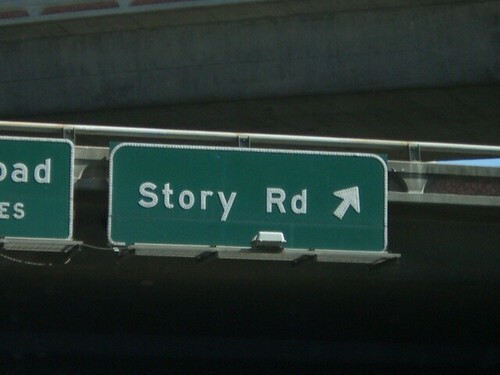 Essentially, it’s storytelling. I’m just using the words and music of others to craft the narrative — as much for myself as the recipient. The other day, I was preparing to head out to celebrate a friend’s moving to Boston from DC to be with his fiancee. With just a short amount of time before we needed to go, I remembered that I had wanted to make him a mix CD. Somehow, I quickly pulled together a pretty decent mix that reflects a lot of the themes at play — starting a new life in Boston, finally being someplace he considers home, being with his true love, his faith and some other relevant topics. After I’m done making a mix, I like to listen through it from the perspective of the recipient. I like to consider the reasons I picked a song, then wonder how the recipient might react to that song selection. Do they get what I was trying to say, or not? I guess it doesn’t matter. I just hope he enjoys listening to it as much as I enjoyed making it. Of all my Amie Street grabs recently, I love The Kissaway Trail‘s “Sleep Mountain” the most. This Danish band has an unpretentious grandeur and a full and lovely sound. They remind me of one of my favorite Norwegian bands, Poor Rich Ones. I really can’t recommend them enough if you want something earnest, fresh, powerful and musically solid. It’s been a great couple of weeks for advance streams of highly anticipated albums. Upcoming albums by the New Pornographers (May 4), The Hold Steady (May 4) and The National (May 11) have all been available for preview from fine media establishments such as NPR and the New York Times (which also did a really cool profile of the band). Early returns are all positive, and I will be at Newbury Comics with my debit card on the appointed Tuesdays, ready to purchase. Also, I’m working on a compilation of my favorite songs of the year so far for the Higher Ed Music Critics blog. So stay tuned for a link to that. The one-year anniversary of this blog may have passed without public comment (Apr. 18), but in my head, the wheels were churning. After some thought, I’ve decided to keep this blog, Safe Digression, focused on my personal life — that includes music, rambles around town, The Project, etc. All of my professional-y posts about social media, online communications and the like will now be housed at georgycohen.com [RSS feed]. This past year of blogging has been a lot of fun, and I’m excited for this change. Increasingly, I was feeling like I was stepping on the toes of one readership by publishing something clearly geared for another. This change gives both my personal and professional life room to breathe online. And of course, don’t forget about my pet project Georgy to Go, the mobile photolog (and Posterous love affair) that just won’t quit. I’ve still got some home decorating to finish over on my other blog (weird to say), but stop by and have a look around! The latest gem churned up by the blog surf is Galapaghost, a uke-wielding, upstate New York-dwelling one man band named Casey Chandler. Find him on MySpace or read what Music for Kids Who Can’t Read Good had to say about him. The Swedesplease blog has long been a favorite of mine, as befitting my fixation on Swedish pop. I also have a fixation on bears. So imagine my delight when a track by a band called Bear Pilot pops up on that blog, and it’s labeled “the best pop song of the year.” We’ll see if that holds up or not, but either way, “The Bravest Year” is definitely a keeper. Here is an older post with Bear Pilot tracks that I had missed, as well. I would say that this song is possibly the best pop song of the year, but apparently I am a year too late. I just discovered Hey Marseilles, by virtue of the fact that their album “To Trunks and Travels” is being re-released on June 29. But a quick spin of my Google Reader reveals that people like debcha were onto their lush pop way before me (probably because they’re from Seattle and she was there, but hey). Anyways, you can download “Rio” for free from their website, and I strongly urge you to do so. Right now. It’s OK, I know you’ll come back here when you’re done. I know I said last week that I was going to be hitting Record Store Day, seeing the New Collisions/Morning Benders and having a grand ol’ time. Well, Saturday turned out to be an epic fail kind of a day, and I didn’t step foot inside a Newbury Comics until 3:30PM, by which time most if not all of the limited edition 7″s and CDs were gone and the New Collisions/Morning Benders had long since broken down their gear. I still grabbed some fun promo discs and, accidentally, saw Mary Gauthier‘s live set at the Harvard Sq. Newbury Comics. I don’t generally gravitate toward her brand of haunting folk, but I did appreciate seeing her live. She has a gift for narrative in song, performing with her heart on her sleeve and grit in her teeth. There wasn’t as huge a crowd assembled for her set as I’m sure there was for the Morning Benders, but I took great pleasure in seeing these two older couples — late 50s, Cambridge, ex-hippie types — who you could tell were probably on her mailing list and made the trek to Newbury just to see her play a free half-hour set. It was an unexpectedly fun time. And the good news? You can download the Auto-Tune the News songs from Amie Street. Sure, it’s not the same as watching the videos, but if you’ve watched them as often as I have, they’ll be playing in your head as you listen. So, if you like politics, pop culture and parody, you’ll love this. Bonus? The Gregory Brothers are really talented, both vocally and musically. When they’re not auto-tuning the news, they are in a band they describe as “Country & Soul, Folk & Roll.” Have a listen on MySpace. They’re quite good. I follow Amie Street on Twitter, and the other day I saw that they had a deal for 50% off music credit. They were also plugging the new releases by Local Natives and Surfer Blood. So I put two and two together, grabbed some discounted credits and applied them toward those albums. I also, since it was still pretty darned cheap, snagged the new Kissaway Trail album. At Record Store Day, the only thing I bought was Nada Surf‘s new covers album, “If I Had a Hifi,” but I am still colossally backed up on my music listening. So I don’t have a whole lot to report on these albums. But I will. The other night, I found myself downloading another Animal Collective song. “Summertime Clothes.” Goddamnit. What you may not know is that Google created an entire project around the concept of that ad. Search Stories allows YouTube users to create their own commercial, using various Google searches to drive the plot. That last word is the most important. In the instructions, they emphasize the fact that your video should tell a story. I appreciate that emphasis a great deal. All you need to do is think up various search terms that would advance a narrative. You can search the web, maps, products, books, images, news or blogs — mix it up for visual variety. They have a variety of music clips (good ones, too) you can set your video to, and YouTube will upload the finished product directly to your account. If you’re doing this for fun, you probably don’t care too much what the searches turn up. If you’re doing it for a brand or organization, however, you certainly don’t want a rogue, unflattering link or image to show up in your otherwise innocuous search for “ice cream flavors” or some such. It’s worth tweaking the wording of your search to fine-tune the results (e.g. “flavors of ice cream,” “ice cream varieties,” “tasty ice cream”) and weed out any unsavory search results. You may also regenerate your video a couple times to alter whichever way YouTube randomly decides to pan and scan across your search results “screen” (e.g. if you want it to zoom in on the top result rather than scan from top right to bottom left). If you create one, please leave the link in the comments! I admit it. I hadn’t paid much attention to Jakob Dylan since the 1990s heyday of the Wallflowers, despite my abiding appreciation for “Bringing Down the Horse.” When I saw that his new album, “Women and Country,” featured the vocal talents of Neko Case and Kelly Hogan, I was mildly intrigued. But it took Dave pointing out their NPR Tiny Desk concert for me to understand what I was missing. Now, “Women and Country” is very much on my list. I snagged Dire Straits’ “Brothers in Arms” for $7 used at Newbury Comics, and it did not disappoint. I think I’ve sated my DS urges for the time being, but it’s probably just a matter of time before I start digging into Mark Knopfler’s solo catalog. So it goes. 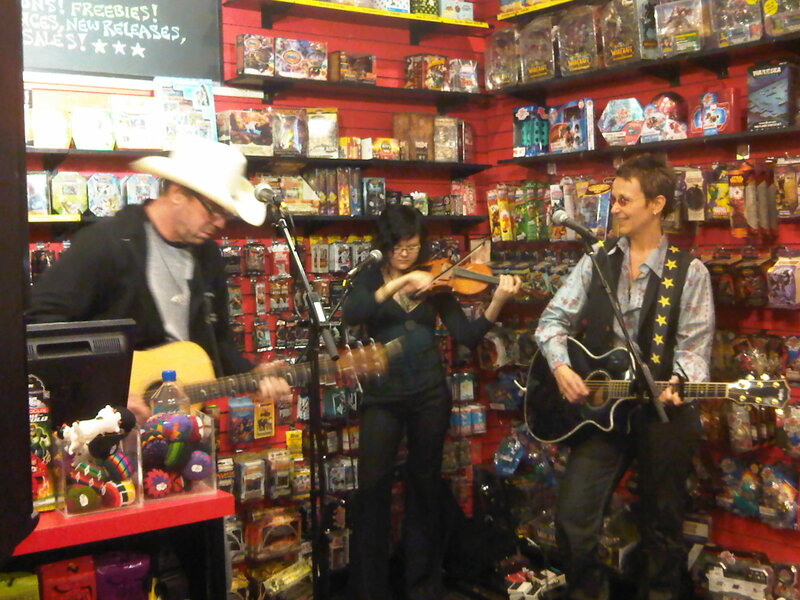 Last Friday, as promised, I caught Freelance Whales’ live in-store at Newbury Comics. I got there a hair before 5PM and was able to snag a spot right up front. It turned out that Newbury was having some problems with their PA, so the band ended up playing acoustic. They were unfazed by the technical difficulties and proceeded to deliver a fun half-hour set. “Weathervanes” is a great album, full of friendly pop and delightful instrumentation. Sure, they are cute and guileless, but also quite talented. A fun way to kick off the weekend early. I learned from KEXP that Cloud Cult is releasing a new EP, “Running With Wolves,” on (fittingly) Earth Day. Lucky for me, it’s available for download right now. Four songs for $2.99 is not a bad deal at all, especially when the EP includes their awesome cover of “Mr. Tambourine Man,” long only available via one of KEXP’s live in studio compilations. I’ve spoken a lot about the amazing music I’ve discovered through WERS. Well, this week is one of their biannual pledge weeks. If you support awesome music, pledge some cash to WERS by Apr. 18. You can also tune in and hear some great live performances, to boot. Speaking of Cloud Cult, theyapparently have a new full-length, “Light Chasers,” coming out Aug. 17. On top of the new Futureheads album I just found out about (“The Chaos,” coming out June 1, download the track “Struck Dumb” here), this music year keeps getting better and better. When Chris Brogan offered up a free copy of a really cool sounding book by Donald Miller to folks who blog about “the importance of story in my life,” I decided to give it a shot. I’ve had a lot of crazy things happen to me in my thirty years — recovering long-lost fathers, discovering long-lost twin brothers, meeting buckets of family members I could never have imagined existed, growing up under circumstances that were trying and unique — and I think about them a lot. I write about them a lot. There are many incredible stories to tell and remember. But when I write or think “about them,” it sets the “them” apart from “me.” Sure, life is happening to me. But I am happening to life. As amazing and bewildering as all of these new family members are to me, I may be similarly bewildering and amazing to them. It’s somewhat humbling to realize that. In my line of work, I fancy myself a storyteller. Whether the medium is a news article, a photo gallery or even web copy, I am trying to tell a story, be it magical or mundane. But it’s important to remember that somewhere, someone is telling a story about you. You are someone else’s story. In fact, there is no “my story” and “your story.” We are all happening to each other. There is just one story. So, with that in mind, the importance of story in my life is that it is a framework for understanding not only the world around me and the things that happen to me, but myself and the things that I do. It places myself in a larger context, and it reminds me that the story is mine in part to tell, to read, to shape, to inform. And that’s a big responsibility, as well as a tremendous thrill. A few weeks ago, I ended up somewhat accidentally walking down the Commonwealth Mall. While I’d crossed or walked down short segments of it in the past, I’d never gone from one end to the other. That day, I realized what a treasure I had been neglecting. The Mall is the link between the Public Garden and Frederick Law Olmsted’s “Emerald Necklace,” weaving a tapestry of of greenery through the heart of the city. On a day like yesterday, with the trees sporting spring’s first green and the weather bright and seasonable, it truly felt magical. 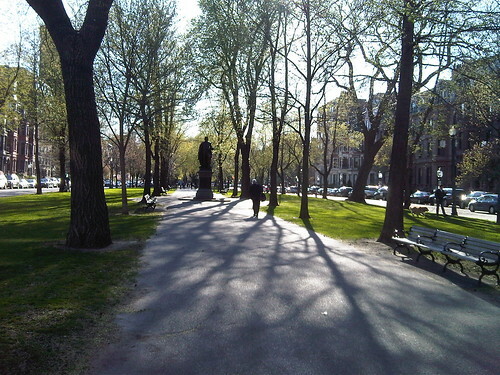 Removed from the commercial hubbub of Boylston and Newbury Streets, lined by elegant brownstones and stately apartment buildings, and just a couple blocks removed from the shores of the Charles that once overtook this very space, the Commonwealth Mall is a special place. While arboreal splendor is a highlight of a stroll down the Mall, the real treasures are the various statues and memorials the inhabit the space. 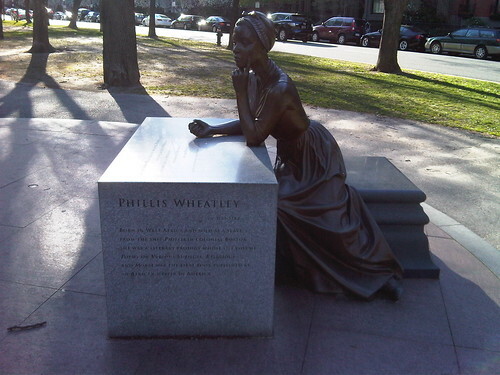 From a regal depiction of prominent abolitionist William Lloyd Garrison (complete with an affirming quote) to a memorial for trailblazing Boston women such as Abigail Adams, Phillis Wheatley and Lucy Stone, the Mall offers a history lesson and a museum visit all in one. There are also statues for legends whose name you may not find in your history textbook, like naval historian Samuel Eliot Morison, whose monument carries the inscription, “Dream dreams, then write them, aye, but live them first.” One of the more striking memorials is to the nine firefighters who lost their lives in the 1972 fire at the Hotel Vendome. My favorites, though, were the ones for ordinary people, like the homeless man who was devoted to the neighborhood’s dogs, or Thomas Walker, whose plaque underneath a young tree simply reads, “Special.” Beneath the boughs of trees flush with the renewal of spring, these lives and moments intermingle for posterity. I took note of the two statues that bookend the Mall: George Washington at the western edge of the Public Garden, and Leif Erikson where the Mall begins its transition to the Fens. On both ends, you have discovery — discovery of a land, and discovery of a country, or what a country could one day be. I like to think that in the space between those two figures, with all the lives immortalized in stone and bronze therein, that sense of discovery lives on in the history we learn and re-learn, in a city that knows that remembering the past gets you halfway toward forging the future.